Reprocessed Mariner 10 data was used to produce this image of Mercury. The smooth band is an area of which no images were taken. 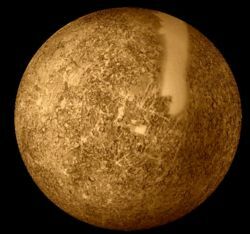 This article is about the planet Mercury. For information about the chemical element see Mercury (element). For information about the NASA project, see Project Mercury. Mercury is the smallest planet in the Solar System and the closest to the Sun. It orbits the Sun in 88 Earth days and rotates on its axis every 58.6 Earth days, which is 3 rotations for every two orbits (called "3:2 resonance"). It can be seen from Earth only at sunrise and sunset. Mercury is one of the five brightest planets. As with the other planets of the solar system, it was named after a Roman mythological figure, in this case the messenger god Mercury who is known as Hermes in Greek. In the pre-Christian era, the Greeks actually gave the planet two different names, as it was believed to be two different objects. The ancients did not realize that it could alternately appear on one side of the Sun and then the other. Mercury was called Hermes when in the evening sky, but was known as Apollo when it appeared in the morning. It is said that Pythagoras, about the fifth century B.C., pointed out that they were one and the same. Mercury's core is made of molten metal, much like the Earth's. The molten Iron core generates the planet's magnetic field. Mercury has a very elliptical orbit. At its farthest distance from the Sun, it is nearly 50% farther than at its nearest distance to the Sun. The precession of Mercury's eccentric orbit was detectable to 19th century astronomers. It was the study of this planet's orbit that Albert Einstein claimed to help confirm the General Theory of Relativity. Specifically, Mercury's perihelion precesses by 574.10±0.65 arc-seconds per century relative to the inertial celestial reference frame. However Newtonian physics alone would predict 531.63±0.69 arc-seconds (comprised of the gravitational pull of the other planets on top of axial precession). This gives a discrepancy of 42.47 arc-seconds between Newtonian models and observations. Astronomers of the period hypothesized either an asteroid belt or another planet (which they named Vulcan) inside Mercury's orbit. Einstein's second-order correction to Mercury's orbit supposedly accounts for 42.98 arc-seconds of precession and obviated the need to look for any unseen asteroids or innermost planet. The theoretical error in the relativity calculation is stated to be around 0.04 arc-seconds. propagating the error on measurements (e.g. the positions and speeds of planets have some uncertainty in them so the Newtonian prediction has some error in it) through produces a theoretical value of 574±0.69 arc-seconds. This is within the supposed tolerance of the observations. Mercury has more or less no atmosphere, and many craters. It has no known moons. A curiosity of the planet is its magnetic field, which is about 1% that of Earth's. Scientists were perplexed to discover its existence, speculating that planet's outer core consisted of liquid iron. However, because it is relatively small and hot, such an outer core would long ago have expired. That Mercury is so intensely cratered would also suggest that Mercury should long ago have given up its magnetic field because of its extreme apparent age. Thus, according to current scientific understandings, the existence of Mercury's magnetic field presents a serious theoretical problem for uniformitarian models of the creation of the Solar System. The problem of Mercury's magnetic field is more acute when one considers that Mars, which is slightly larger than Mercury and spins much faster, has a much weaker magnetic field. Creationist Russell Humphreys has an alternative theory: that planetary magnetic fields do not form by dynamo action, and Mercury's relatively wide and conductive core has preserved its magnetic field. The cores of Mars and Venus are smaller, and thus the magnetic fields have decayed more rapidly. Nevertheless, the decay of Mercury's magnetic field, according to Humphreys, is quite rapid. In fact, according to Humphreys' extrapolations of the decay time and half-life of the magnetic field of Mercury, the magnetic dipole moment in 2008 should be four percent smaller than that measured in 1975 by Mariner 10. Specifically, this should be (4.5 ± 0.25) × 1019 N-m/T. On January 14, 2008, MESSENGER made rendezvous with Mercury and measured its magnetic field. This rocket probe's measurements are consistent with a magnetic dipole moment of (3.8 ± 0.7) × 1019 N-m/T. This represents a significant decline from the Mariner 10 measurement, because the two measurements differ by more than the sum of their respective tolerances. More to the point, the higher tolerance range of the current measurement lies well within the predicted magnetic dipole moment that Mercury should have at present. If, on the other hand, the true measurement is less than predicted, that would pose an even greater problem for uniformitarian astrophysics, because such a rapid decay would be utterly inconsistent with an age for Mercury of 4.6 billion years. It would present no problem with the Humphreys model, but would suggest that the core conductivity and/or conductive mass of Mercury is less than Humphreys initially supposed. ↑ 1.0 1.1 Humphreys, D. R. "Mercury's Magnetic Field is Young!" Creation Ministries International, August 26, 2008. Accessed October 2, 2008. ↑ Williams, David R. "Mercury Fact Sheet." National Space Science Data Center, NASA, November 30, 2007. Accessed May 29, 2008. ↑ 3.0 3.1 3.2 Humphreys, D. R. "The Creation of Planetary Magnetic Fields." Creation Research Society Quarterly 21(3), December 1984. Accessed April 29, 2008. ↑ 4.0 4.1 Calculated from observed present magnetic dipole moment and expected magnetic dipole moment at creation. ↑ Hartnett, John. Starlight, Time, and the New Physics. Creation Book Publishers, 2007, pp. 34-36. ISBN 9780949906687. ↑ Psarris, Spike, Our Solar System: Evidence for Design, Seattle Creation Conference, 2006. ↑ Franco, Lucia M. "Lecture 10.1: Mercury." Astronomy 100 at Indiana University Northwest, Indiana University, 1996. Accessed April 17, 2008. This page was last modified on 26 September 2018, at 13:27.